Marble Cliff residents are considered residents relative to costs for using the Grandview Heights municipal swimming pool. Early Bird Discount for Pool Memberships ends April 30, 2018. Purchase your pass today online www.grandviewheights.org/onlinereg or purchase at the Grandview Heights recreation center at 1515 Goodale Blvd. For more information, call the Grandview Heights Parks and Recreation office at 614-488-3111. Marble Cliff is located about 3 miles northwest of downtown Columbus, between the cities of Upper Arlington, Grandview Heights and Columbus. All Marble Cliff residents vote at First Community Church, 1320 Cambridge Blvd. The polls are open from 6:30 AM to 7:30 PM. 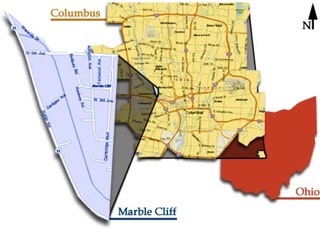 Marble Cliff is in the 3rd Ohio Senate District and the 17th Ohio House District. Marble Cliff is in the 15th Congressional District.